The Mansfield (OH) News Journal today has a feature on the trip Jason Carmean (in photo) took along with AGBM president Joel Richards to the Central African Republic. Jason is pastor of the Grace Brethren Church in Lexington, Ohio. This is an excerpt–to read the entire article click here. LEXINGTON — A second trip to Central Africa wasn’t what Jason Carmean originally planned. 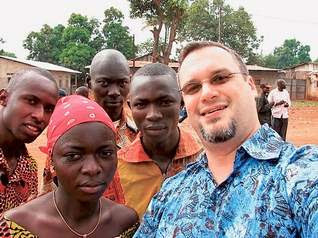 But after spending two weeks volunteering in Bangui, the Lexington Grace Brethren Church pastor knew he would go again. From Oct. 30 to Nov. 14, Carmean, along with another pastor from California, helped train other Grace Brethren pastors in Central Africa. Carmean said the African churches were growing so fast that pastors couldn’t keep up. “They’re having to rotate among the different churches,” he said. “I was at a conference this summer and they asked for qualified people who were interested in training more pastors over there. Upon stepping off the plane, Carmean said, he was shocked at the level of poverty he witnessed.